"They haven't really been taken away. They have only gone with the Angels to play. They have been given wings with which to fly. All their troubles have passed them by. Their life in heaven now must start. But we'll hold their memory in our hearts. Nothing about them will be forgotten. But now they sleep on billowy clouds of cotton"
"Nuala was my 50th Birthday Present from Charlie, the best present a girl could ever have. 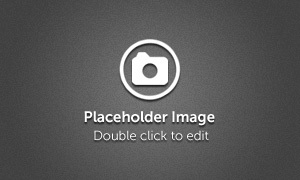 Nuala is a typical Irish name meaning 'exceptionally beautiful and fair shouldered.' And true to her name she was, she had the most fantastic temperament and loved everybody and everything. From day one she fitted into our family and loved Tilley, Tia, Toffee and Oliver ,although a bit of spoilt child would not share her rubber rings and football !!! She took her job as 'Meeter and Greeter' at Belshedo Pets, very seriously and loved to give all our customers that lovely Belgian smile. 11 days ago I found a lump on her neck so took her to the Vets the same day. She had bloods done and a needle biopsy and in case it was an infection strong antibiotics and anti inflammatory medication. However the lump continued to grow and by the time the results came back our worse fears were confirmed, Lymphoma. Despite the excellent care of Peels Vets at Hornsea the tumour was so aggressive that by this morning she had very restricted breathing and great difficulty in swallowing. We made the heart breaking decision to give Nuala peace. I can't thank Jean and Paul enough for letting me have this wonderful girl and for Charlie for getting her for me. The Irish Muppet maybe gone from this world but she will never be forgotten . RIP Sweet Nuala xxxx" Jane Willingham. We got the sad news that 'Warren' was given sleep to prevent further suffering way too young at only 10.5 years. One of the easiest dogs to live with, with a gentle, quite and gentle nature 'Warren' lived out his last few years with Mary and Monica Teehan where he became a registered Therapy Dog, bringing happiness to many elderly residents in the local Nursing Home. Sire of our 'N' litter we are thankful that we have his progeny. Our thanks to Monica and Mary with whom he lived a happy life and who are heartbroken at his passing. A difficult day today...we had to make the decision to let our beloved 'Duchesse' go...the sweetest girl with a funny, quirky nature and the most evil grin. 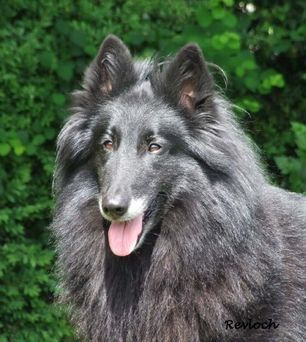 'Duchesse' came to us from Belgium in 2007 aged 3 years and has been a joy to live with, thank you so much Karin Nuytsand Luc Grobben for agreeing to send her. 'Duchesse' was never a real show girl, she thought it was beneath her and preferred to show herself off at home, she was a joy to watch up the field where her movement was poetry in motion. We got the sad news that Lennox (Lenny) owned and adored by Eamon and Ann White was given sleep and they are devastated and already missing him terribly. Lennox was such a gentle and kind soul who achieved so much in his show life, winning top honors even in his veteran years handled by Eamon, they were a perfect team. He was Best in Show at the BSD Club Show under the late breed specialist judge Gert Christensen, a very special day for Ann and Eamon. He won many Groups and Group places, Best in Show places, multiple Stakes classes and was Annual Champion and Top BSD in Ireland for so many years. Thank you so much Eamon and Ann for loving Lennox so much and giving him a fantastic life and for all the successes you achieved with him on behalf of our kennel, he has earned his place in the Hall of Fame for Belgians in Ireland. 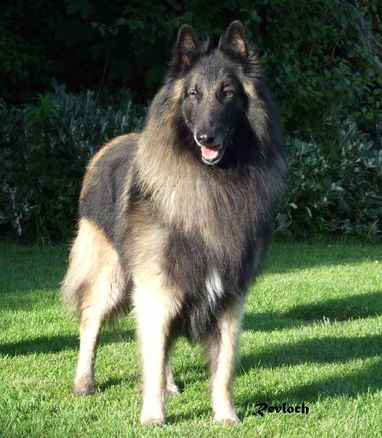 'Lewis' was a very very special dog in so many ways, he not only had beautiful type, construction and movement but also the perfect temperament for a Belgian Shepherd, it was outstanding and we are so proud to be his breeders. He was owned by Nuala O'Brien and Liam O Brien who gave him a wonderful life and are devastated to have had to let him go. 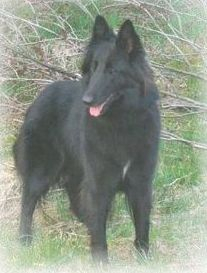 'Lewis' quickly became an Irish Champion and then began his agility career becoming the first Premier Agility BSD in Ireland at a young age, he sired a litter for Nuala and Liam which also all competed successfully in the agility ring.His groenendael daughter 'Inca' (R Enchanted Whisper), herself a Grade 6 agility dog in the UK, won her 3rd CC to become UK Champion. 'Lewis' is also the sire of 'Zidane' (sr IR/GB/LUX/NED CH, BISS Revloch Zidane and it's so hard now that this precious piece of him is also gone, we can only take comfort that they are together now. 'Lewis' is also the sire of the Beljekali 'Y' litter, and 'Puddin', an amazing Ambassador for the breed in Australia, thank you Julie Fynmore and Craig Fynmorefor recognizing Lewis' qualities that day in our front garden when he came to meet you. Nuala O'Brien and Liam O Brien we are mourning with you today, there will never be another Lewis he was unique and produced unique and his legacy continues in his children and grandchildren. Thank you for giving him a wonderful life and allowing him to be the fantastic sire he was, we will never forget him. 08.12.01 - 13.01.16 A big personality is gone from our lives this morning.......the one and only 'Toyah' (Bonvivant Cause Celebre at Tiggertoo x Ch Lanaeken Savoire Faire) loved by everyone who knew her, the time had come to give her sleep. We will miss her so much. 'Colby' was killed in a tragic traffic accident at only 15 months of age. He was much loved and spoilt by Dianne McMullen. 'Kiwi' (12.11.05) and 'Paavo' (30.06.02) went to sleep side by side together, just as they had lived. We are forever thankful to Tina Heinonen and Pia Saares of Kennel Curiosity in Finland for entrusting us with these two beautiful Silkies who have left us with many happy memories. 24.12.05 - 06.08.15 'Eve' came to us when she was 6 years old and set the show rings in the UK, Ireland and Holland alight. We are forever indebted to Hannah Percival for allowing her to come to us. She was a true Ambassador for the breed in every way, unfortunately she succumbed to cancer at just 9 years old and we are thankful that we have her progeny to go on with. 'Denzel' went to live with Helena and Dave Lonergan when he was 5 and was their constant companion until his death. He was a joy to live with and we will be forever grateful to Helena and Dave who adored him and miss him terribly. 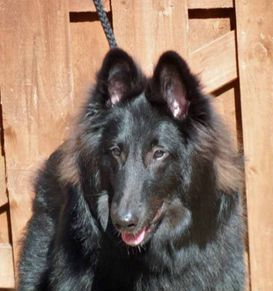 'Foster' was exported to the USA to Teresa Ann Gettings of Silhouette Belgian Shepherds who starved him and many other dogs to death, a crime for which she was found guilty but handed only a light punishment. It is a breeders nightmare to know that one of their puppies suffered in this way and while we never received full closure and identification of 'Foster' we thank all those fellow breeders and dog lovers who gave their time and support in an effort to find out exactly what happened to him. We will never forget 'Foster' and remember him as a happy, confident and social puppy. 'Nina' was owned and loved by Mary and Monica Teehan who gave her a wonderful life. She is sadly missed and remembered as a sweet and gentle girl. 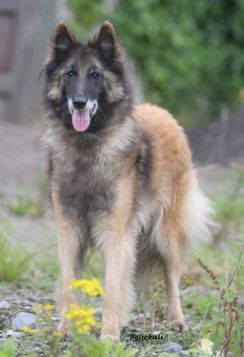 Zidane was born on 4th August, 2009, the result of an inter variety mating carried out after receiving permission from the Irish Kennel Club. 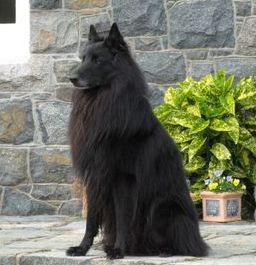 His sire was a tervueren that we bred IR CH Revloch Ready To Rumble with Nulikim and his dam was our Belgian imported groenendael IR CH Duchesse du Pre du Vieux Pont at Revloch. 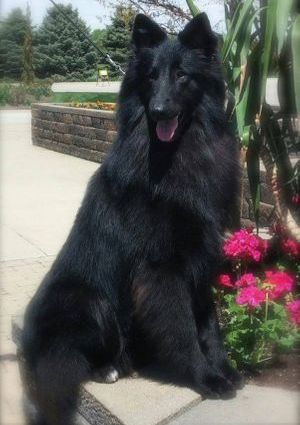 He was the only groenendael male on the litter of 9 and stayed at home with his us….little did we know then just what he would achieve in his short life. His show career began in Ireland in February, 2010 at 6 months when he won the Dog GS and BOB under Irish all rounder Vincent O'Brien who remarked on the day that he thought he was something special and predicted he would go far. 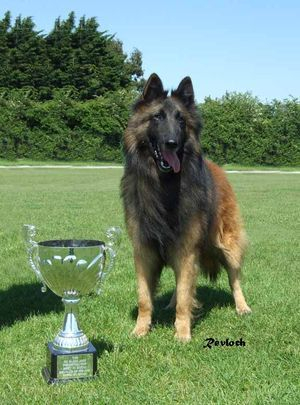 Zidane's first CC came in August, 2010 when he won the Dog CC, Res BOB, Res Best in Show and Best Puppy in Show at the BSDA of GB Club Ch Show, under breed specialists Sandra Smith, Lebeau (breed) and Kathy Bird, (BIS). 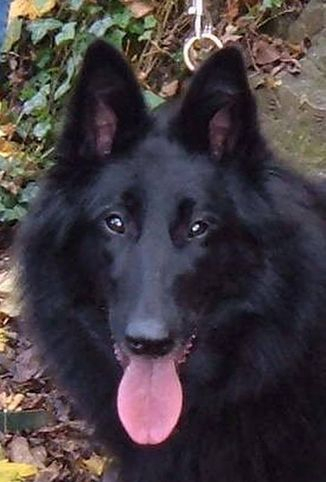 He finished up Top Puppy in the UK that year and Top Groenendael in Ireland, having won more then the required 7 Green Stars for his Irish Title but this didn't come until after he had reached the age of 15 months in November, 2010. Over the next three years he amassed a total of 18 CC's (12 with BOB) and 3 Res CC's, including the CC and BOB at Crufts in 2011 and 2012 and the Res CC in 2013, plus CC, BOB and BIS at the NORBEL Club Ch Show in August, 2012 under Jesper Anderssen from Sweden (breed) and Gil Cooper, Zantal (BIS). 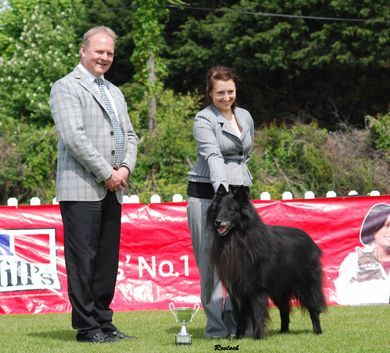 He won the Pastoral Group at Belfast Championship Show in 2011 under Jean Lanning and was Top Groenendael in the UK in 2011 and 2012. 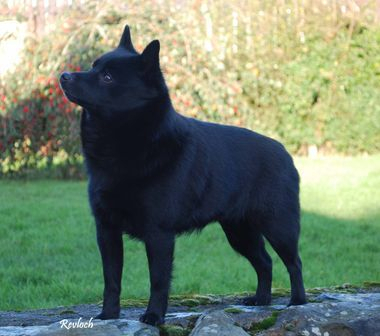 Also a multi Group and Champion Stakes winner in Ireland and Top Irish Show Dog qualifier 2011. His 18th CC (with BOB was won at East of England in July, 2013 under Gordon Rual. 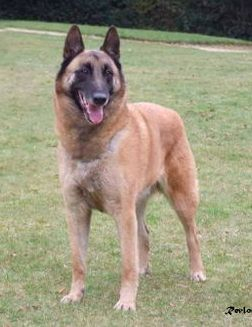 Zidane also gained his Luxembourg and Dutch Champion titles, won the CAC at the Paris International Show in 2012 and at the prestigious French Speciality the following August, he was placed 16th Ex from an entry of 59 dogs in the Open Class, passed the CSAU (Social) and TAN (Gunshot) tests, and was only one of 5 Groenendael males selected SR (recommended for breeding) the following day. Another one from that litter exported to Portugal was Junior European Winner and placed 2nd BIS Junior in Geneva. In the UK he is the sire of the young female CH Chrisvale Loving Feeling at Vanisticawho gained her 3rd CC at only 14 months at Bournemouth Ch Show in August, under specialist Jeff Luscott. 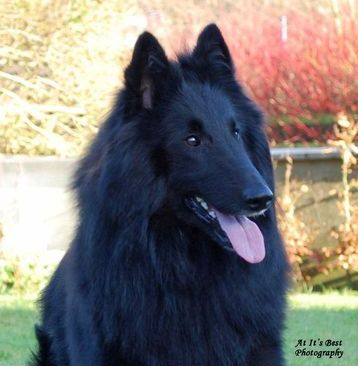 Another young female Ebontide Vision in Black at Groenveld has 1 CC and 8 Res CC's and our own youngster Revloch Figo won his 1st CC from puppy at National Working & Pastoral Breeds in July at just 9 months under breed specialist Lyn Salt (Woodlyn) and is currently Top Groenendael Puppy in the UK. Besides being an outstanding Belgian Shepherd of excellent type with a beautiful head, eye and expression and typical harmonious silhouette, Zidane also had the most wonderful character and made a huge impression on people from all around the world. Those who met him in the flesh were completely won over by his lovely personality and have been firm admirers and supporters of his many successes. 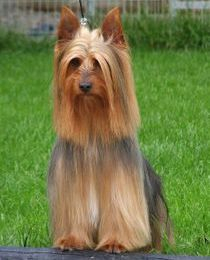 He has passed on this outstanding temperament to his puppies. We had hoped to have Zidane back in the ring for Darlington Ch Show but our world was turned upside when he took ill quite suddenly and unexpectedly and tests revealed he had lymphoma cancer (linked to pesticides) which was aggressive. Despite immediate treatment he failed to respond and the decision was made a few days later on 11th September to spare him from any further suffering. His passing has left us devastated and in shock. He had only turned 4 years and was just entering his prime years. We were looking forward to enjoying many more years with him in the ring as he was the ultimate showman and loved the limelight. But aside from the wins and glory, he was just quite simply a much loved companion, a joy to live with, a 'dog in a million'. We have been overwhelmed by the hundreds of messages, posts and calls of sympathy and support on the news of his passing from his admirers and supporters around the world, we are so proud that he touched so many people and thathis leg acy lives on in his offspring. 'Dudley was given sleep to save further suffering. A brother to our own 'Toyah', he lived in the UK with Dave and Yvonne Brason with whom he lived a wonderful life. 'Dudley' was the sweetest of dogs, a real gentleman and our sympathies go to his owners Dave and Yvonne Brason (Flambards), we know you will miss him lots and thank you for giving him such a happy and caring life. To lose on much loved pet is hard but to lose two within a few days is heartbreaking and we were so sad to hear that Bernard and Jo Keogh had lost their beloved 'Rico' first and then 'Spencer. Our thanks to Bernard and Jo for giving them a wonderful, happy life since adopting them both when they were very young. Breeding can be the most rewarding thing in the world with many highs, successes and achievements but this can all be forgotten in a moment with the kind of news that we received. It was discovered that 'Storm', not yet 11 months, had an aggressive tumour on the liver and the prognosis was bad, vets said it was a one in a million condition...he had, at best, 6 months if treatment was started. His devastated owners made the difficult decision to spare him any suffering and our thanks to them for putting his welfare first and foremost..we know he holds a very special piece of their hearts. 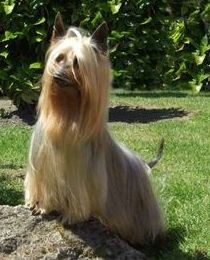 'Tiggy' was our first Silky Terrier, a present for Kelly. Together they had great success in both the Junior Handling and Breed rings. 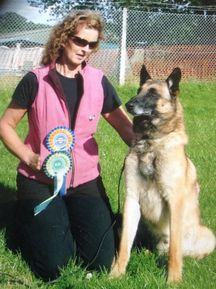 Kelly handled her to win Runner Up Top Junior Handler in 2005 and Top Junior Handler in 2006. They also won the Veteran Stakes at Newtonards in 2005 under Susan Kealy and after accumulating enough points under the old system, came back and won her crowning green star at Deise under Linda Mills. She retired from the ring and spent her last few years with Paul's parents Paddy and Sally, where she was the Queen of the house! Today the heartbreaking decision was made to let her go to prevent any more suffering. RIP 'Tiggy-Wiggy' you'll never be forgotten. We were so sorry to hear the sad news that 'Peile' had passed away suddenly a few days after his 12 birthday. He was Val Neff's constant and faithful companion and she is devastated at his loss. Not only was he successfull in the show ring, having won the Dog CC at Crufts in 2007 but he also excelled in obedience and worked on the farm with Val throughout his life. Our thanks to Val for giving 'Peile' a wonderful and happy life. 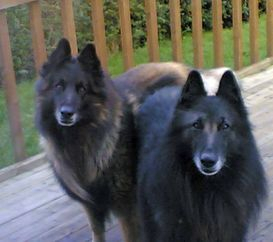 She is now at Rainbow Bridge with her dad 'Felix', mum 'Demi' brothers 'Dexter' , 'Justice', 'Keano' and 'Token' having succumbed to stomach cancer. She had the most loving gentle nature and loved children especially. We were very sad to receive the news that 'Misha' has passed away. 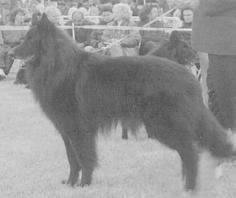 She was Liam and Nuala's first Belgian and dam of their Nulikim Tervuerens who have excelled in both Agility and Show rings in Ireland. Our sympathies to Liam and Nuala who we know will miss her terribly. We remember her with pride and fondness. A shock came totally out of the blue when we suddenly and unexpectedly had to say goodbye to our lovely sweet little 'Zayra' after she was diagnosed with stomach cancer. She wasn't yet 10 years old and we can't believe this has happened, so soon after losing 'Felix'. 'Zayra' was a total sweetheart, a fantastic mother and producer and is the Dam of our successfull "R", "U" , "V" and "W" litters. Today we made the difficult decision to say goodbye to 'Felix' our beautiful, sweet, gentle 'big boy'. We shared some fantastic experiences together over the years. 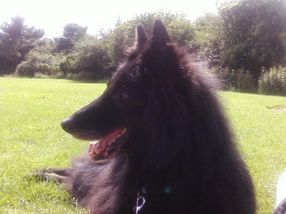 A one in a million dog who has left us with some great memories. From the time 'Felix' made his debut in the ring at 9 months old he made a big impression and won many admirers. 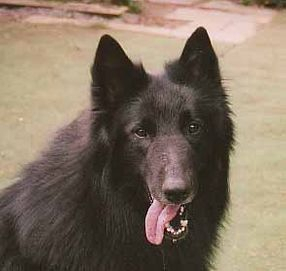 He won 20 CC's in the UK and was Top Groenendael Dog there for 5 years. 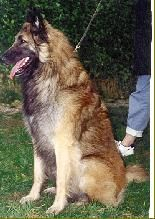 He won BOB at Crufts in 2000 and was Best in Show at the BSDA of GB Club Show in 2001. He was a multi-Group Winner in Ireland and sired numerous Irish Champions including IR & GB CH Revloch Notorious. We are so very lucky to have had him in our lives. We were very sad to hear of the passing of 'Shania' who was loved and adored by Rachel Hayes and family who she lived with for 11 happy years. 'Shania' was a daughter of our dear 'Perry' CH Revloch Incognito and she inherited his outstanding character and personality. She lives on in her grandchildren who are currently doing so well in the ring here in Ireland. It is always hard to lose an elderly dog that has given many years of pleasure and devotion but to lose one that is young is equally heartbreaking and we were devastated to learn of the tragic passing of one of our last litter on 15th May, 2009. 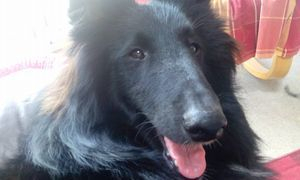 'Mira' failed to recover following a routine operation at only six months old. Our deepest sympathy to her devastated owners Ines and Jim Casey who are lost without her. We remember 'Mira', the smallest of the five girls, who was the one first out of the box as soon as she could walk and the one who loved to explore everything. "Good bye my wonderful and beautiful 'Mira',I was so proud of you. You were so special, ma petite cherie. I shall never forget you. Adieu ma merveilleuse Mira,qu'est-ce-qu'on a pu s'amuser toutes les deux,tu vas tellement me manquer. La vie est trop dure parfois!" 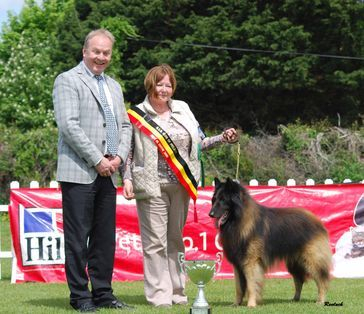 We are saddened to hear of the passing of 'Danie' who was Sheila and Claire's first Belgian and first Champion. He played an enormous part in their lives and now leaves a huge gap after succumbing to bone cancer. We know that 'Danie' had a very happy and fulfilling life with Sheila and Claire and we wish them happy memories of him for many years to come. 'Perry' was a total pleasure to live with, he was an only pup and survived a difficult birth, but this didn't effect his outlook on life. "The eternal optimist", he lived every day with a happy enthusiastic attitude, he didn't have a bad bone in his body and loved everybody. 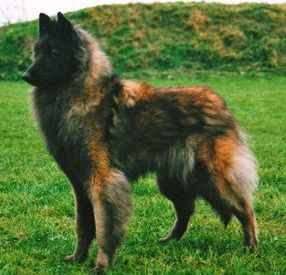 A born showman, 'Perry' made us so proud in 2000 when he won Reserve Best in Show at the Irish Kennel Club St. Patrick's Show. His children from the 'R' litter include a multi Group Winner, a Premier Agility Dog and a Norwegian Champion. His last show was the BSD Club of Ireland Breed Ch Show in 2005 where he won Reserve Green Star and Best Veteran in Show at the age of 9. Even up to the end 'Perry' was happy which is how we will always remember him. The light is dimmer without him! We are very sorry to hear of the passing of 'Keano' from stomach cancer, a much loved companion of Lisa Davies. 'Token' was given sleep to prevent further suffering from seizures. He was much loved and cared for by Julie Tweed and family who did everything possible to make his life a good one. 'Sophie' was the constant companion of Christy Whelan for 13 years who misses her terribly. We are sad to hear of the passing of 'Harlem'. 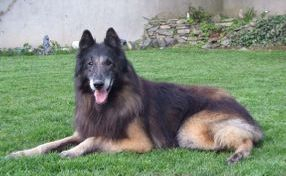 Owned by Rachel and Frankie Hayes and their children, he was a much loved family dog. Shown lightly as a youngster winning Major Green Stars he was given sleep after suffering a stroke and is very much missed. 'Aimee' was given sleep to save further pain and to keep her dignity after being diagnosed with cancer in August ‘06. 'Justice' was given sleep to prevent further suffering from seizures. A much loved and cared for companion of Jackie and Martin Hotton who strove to give him a good quality of life during his illness and who miss him terribly. 'Aza' came into our lives for a weekend and stayed. She was a wonderful Ambassador for the Breed, a 'one in a million dog, who we adored. She was loved and remembered by all who knew her. Her passing has left a huge gap in our hearts and in our home.